This study has 8 sessions, incorporating an introductory session and 7 lessons. 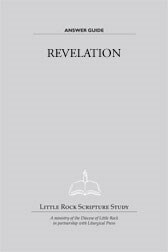 The Study Set includes the Study Guide by Little Rock Scripture Study Staff and the New Collegeville Bible Commentary, The Book of Revelation, by Catherine A. Cory (Liturgical Press). Catherine Ann Cory, PhD, is an associate professor in the theology department, at the University of Saint Thomas, St. Paul, Minnesota. She is the author of Voyage Through the New Testament (Prentice Hall) and a variety of articles related to the Bible. This study invites the modern reader to revisit a volatile period of history through apocalyptic, symbolic writing. Enter into the struggle between good and evil, hear the call to conversion and experience God's ultimate triumph. Revelation's apocalyptic imagery, symbolic colors and numbers are explored. The evils of the Roman Empire during a specific period of time persecution are behind much of the apocalyptic imagery. It contains letters to seven churches of Asia Minor (modern Turkey), which urge faithfulness to Christ. Powerful visions of God and the victorious lamb in heaven are unveiled as God and the lamb achieve the ultimate and absolute victory over evil, culminating in a new heaven and a new earth with a new Jerusalem as home to God's holy people. Only one Answer Guide is needed per small group facilitator. Order all Study Sets for participants separately, as well as one set of the Wrap-Up-Lectures.